The flood of refugees into Europe from Syria as well as other countries has made visible the human cost of the instability of the region. 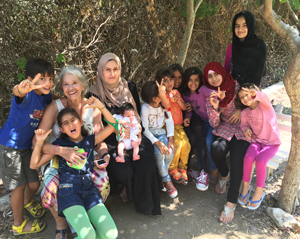 Last spring our own Sallie Latch responded to this humanitarian crisis by going to the Greek island of Somos to help the large number of refugees landing there. Now after eight months of compassionate service, this 83-year-old little lady returns to San Miguel to tell her story. Sallie describes the refugee camps, the conditions that caused families to flee their homes, how the humble people of Somos shared what little they had with those who arrived on their shores with little except the wet clothes on their backs. She taught the children and interviewed many of the asylum seekers, recording their stories. Those interviews will soon be available on CDs and in a book Sallie is writing.